When Bailie John Hardie introduced the first stocking frames to Hawick in 1771, little did he realise what he was about to create. In less than 100 years the town was the very centre of the knitwear trade in Scotland. That expansion continued with foreign markets being conquered. In the 1960’s Hawick became the highest dollar-earning town in the United Kingdom per head of population. Production was not restricted to knitwear. The wearing of tweed became highly popular in the early and mid 1800’s with manufacture being readily established in Hawick and similar success being enjoyed. The reason for that success is readily identified. It was a skilled workforce producing a high quality product, and manufacturers leading the market in both innovation and design. 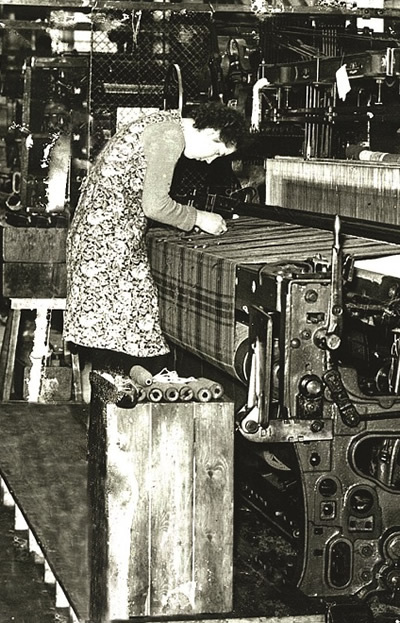 Companies like Pringle of Scotland and Lyle and Scott were flagships for the knitwear industry, while Wilson & Glenny and Blenkhorn Richardson were at the forefront of tweed manufacture. Times have changed but Hawick still produces a quality product with a skilled and dedicated workforce. In knitwear, the likes of Hawick Cashmere, Wm Lockie, Scott & Charters, and Johnston’s of Elgin sell worldwide and sell well, with specialist companies such as House of Cheviot and Sam Barker enjoy niche markets. If it’s quality tweed you’re after, Hermitage Holdings fit the bill. Hawick has diversified in recent years, attracting world plastics giant Emtelle to the town. Nationally respected engineering firm Turnbull & Scott (https://www.turnbull-scott.co.uk) have relocated to larger premises, while the construction of our Heritage Hub, specialising in ancestral tourism and research, also provides employment. Much respected bloodstock sales company, Goffs has a business outlet in the town, and world renowned fashion house Chanel has invested in a skilled and dedicated workforce. Hawick has tradesmen a-plenty catering for all sizes of contract from daily maintenance to million pound contracts, and has ample back-up for businesses with our service industry.